In a nod to National Poetry Month, Landmark College professor and Robert Frost scholar Daniel Toomey will discuss Frost’s ties to Marlboro College for the Brattleboro Words Project’s monthly Roundtable Discussion Thursday, April 18, 2019 at 118 Elliot at 6:00 pm. The event is free and refreshments will be served. It’s a little known fact that Robert Frost had a hand in the founding of Marlboro College. 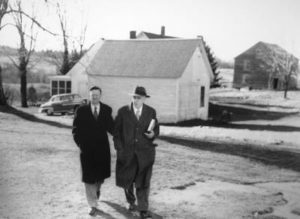 In 1917, when Frost started teaching at Amherst College, he began his mentorship of Walter Hendricks, the writer, educator, and publisher who would go on to found Marlboro College in 1946. Robert Frost read a poem at the school’s first graduation, and in the college’s early days he would visit campus and practice what he called “education by presence,” listening to students’ ideas and sharing his own in a free interchange. As Daniel Toomey will show on April 14, Frost had a lasting influence on the Marlboro College community and way of life, and his presence remains. Roundtable Discussions are also an opportunity for Words Project research leaders and teachers to share information and inspiration and for members of the public to discover how they too can participate in making podcasts about sites and themes important to our region’s storied past. Click here to learn more about the Words Project’s Robert Frost research site.